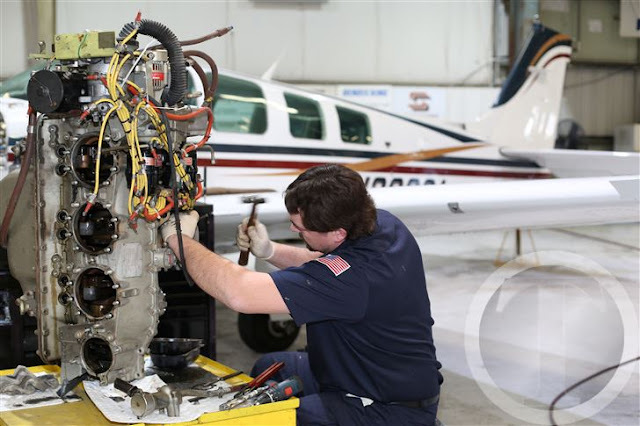 Justin Pearson, chief inspector for Air Care Aviation Services, works on an airplane engine Friday at the Rocky Mount-Wilson Regional Airport. The director of the Rocky Mount-Wilson Regional Airport said the condition of the runway, on a scale of one to 10 — with 10 being the worst situation — is an eight right now. "It's that bad," Dion Viventi said in an interview in the airport's lobby late last week, moments before he went outside to show the runway's cracked surface. Fortunately, help is going to be coming, thanks to a grant package of more than $14 million via the state Department of Transportation to restore the runway. Viventi said the funding is going to be comprised of $6 million from the federal government, $7 million from the DOT Division of Aviation and $1.4 million from all five local governments that sponsor the airport. "I lobbied pretty hard with the state to take a look at the existing conditions," Viventi said of the runway, which is 7,100 feet long. 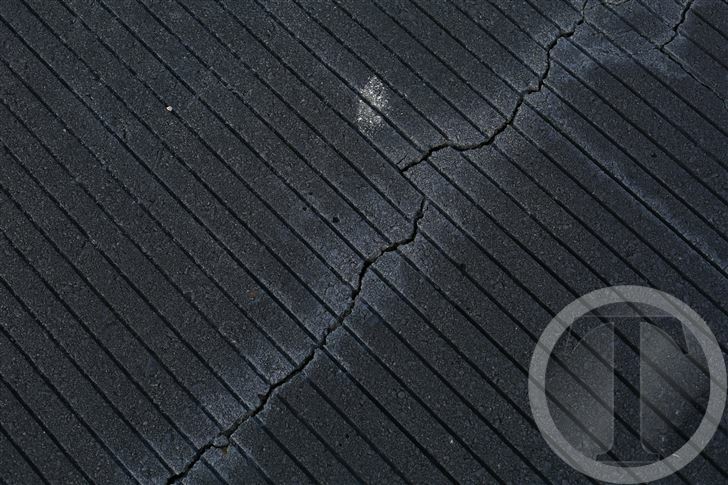 Viventi said the state did an assessment and determined the pavement would soon be failing. "And that's when the wheels started turning towards looking for a suitable funding source," he said. He said the state came through and offered to help, provided the airport could obtain a local match. That local match came from Rocky Mount's, Nash County's, Edgecombe County's, Wilson's and Wilson County's government. Wiley Clay woks on a plane Friday at the Rocky Mount-Wilson Regional Airport. He said the work is going to start this spring and is going to be completed before the next calendar year. He said the project is going to include resurfacing the taxiway and realigning the connectors between the apron and the taxiway to federal standards. He also noted this is the largest state grant for an airport in North Carolina in approximately 15 years. The runway was built in 1969 and Viventi believes the last resurfacing project was approximately 10 years ago. He noted what's called a "slurry coat" was put down to buy the airport time until a solution could be reached. The Rocky Mount area is presently the scene of an aggressive recruitment of new businesses and industries, which is one of the reasons the airport pressed for funding for the runway project. Viventi said he and his team don't want to put the airport in a position in which prospective businesses come and the runway isn't adequate for their aircraft. "The biggest impact is the airport won't have to shut down because the infrastructure health will be rejuvenated," he said. 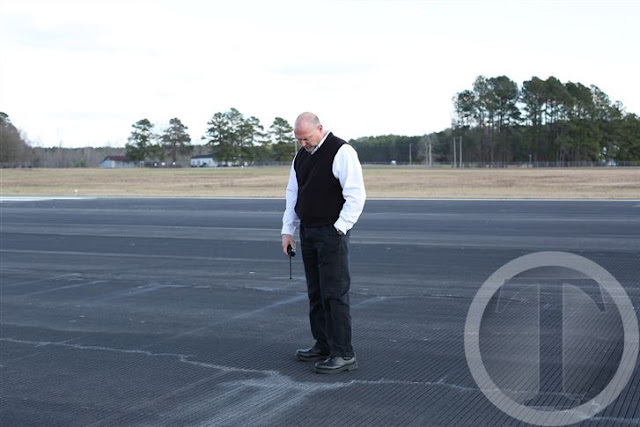 Airport Director Dion Viventi looks at the cracks on the runway Friday at the Rocky Mount-Wilson Regional Airport. Additionally, Viventi said two more major projects are scheduled to help improve the airport. One of them, he said, is a plan to remove four old and empty underground fuel storage tanks at a far edge of the airport and place an emphasis on using a nearby above-ground fuel storage facility. The above-ground facility already has two tanks, with the plan being to install a third tank. He said that project is going to cost approximately $300,000, with the state to help by providing 90 percent of the funding and the remainder to be covered locally. The other project, he said, calls for constructing new T hangars, with the state having awarded $2.1 million to cover the entire cost. T hangars will enable the airport to have cluster units for storing airplanes. Viventi estimates both the fuel farm and the T hangars projects should be complete by this spring. The airport is already quite a busy place, with high-quality aircraft landing and taking off, as evidenced by a Clayton Homes executive jet just outside the lobby. Viventi said the airport presently has seven hangars and 27 based aircraft, including four jets and two helicopters. He said the rest of the aircraft are single or multi-engine. He said there are approximately 30,000 operations, that is, take-offs and landings, a year. He also pointed out a new report from the DOT's aviation division, which includes data showing the Rocky Mount-Wilson airport's impact has resulted in 450 jobs, nearly $26 million in personal income, nearly $2.87 million in state and local tax revenues and more than $69.7 million in economic input. Viventi, 53, has been the airport's director for 2½ years. Prior to that, he had been director of the Elizabeth City Regional Airport for slightly more than 2½ years. 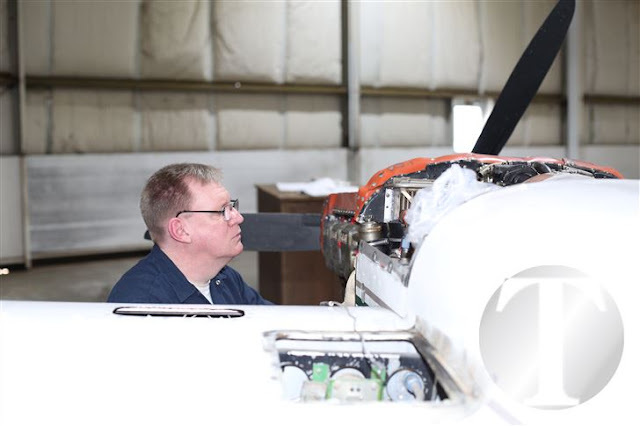 An engineer by trade, he's a commercial instrument-rated pilot who became interested in aviation after he first began working for the DOT in the early 2000s. More specifically, his interest began while working as an engineer for the DOT's aviation division. James Pearce, a spokesman for DOT's aviation division, in commenting about the runway project at Rocky Mount-Wilson Regional Airport, particularly focused on the $1.4 million in matching funds. A crack on the airport runway is shown Friday at the Rocky Mount-Wilson Regional Airport. "And so what we're seeing here is a project that isn't just supported at one level," he said. "You're seeing funds come in from the federal government, from state government, from local government — and county and city. "And so that really goes to show how much value this project can have in helping grow that airport and helping with economic development and business recruitment efforts in that part of the state," he said. Carolinas Gateway Partnership President and CEO Norris Tolson, noting he's also a former state transportation secretary, said he believes the Rocky Mount-Wilson aviation facility is one of the better, if not the best, rural airports in North Carolina. "Rocky Mount-Wilson Airport is one of those crown jewels, unsung, mostly unheard-of jewels that people have in their communities," he said. Tolson noted that he and his team spend much time working with Viventi and the airport authority board "because we see it as a great asset for what we do in economic development." "We have some very good plans going forward to make that an even bigger entity for us in the Twin Counties," he said.